Department of Economic Development director, Debbie-Durham. Governor Branstad and his Department of Economic Development director have unveiled their plan to get rid of the state agency and replace it with a public-private partnership. The Iowa Partnership for Economic Progress, which they’re calling I-PEP, would accept money from private companies to finance things like advertising campaigns to market the state or travel to other states to recruit new businesses. “With this help from the private sector when we go through an economic downturn like we’ve been through in the last few years, we can go to the private sector — they understand the importance of this — and can help us finance things,” Branstad says. 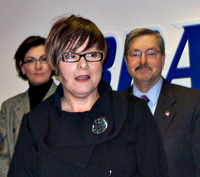 Debi Durham, Branstad’s economic development director, would head the new entity. “I-PEP” would have an “Authority” that would handle taxpayer dollars — state and federal grants, for example. Representatives from some of the state’s largest businesses have agreed to serve on an advisory committee that would oversee the operations of the Iowa Partnership for Economic Progress. Legislators will have to approve the creation of this new-fangled entity and Durham has begun briefing lawmakers about the details.